An izba (Russian: изба́, IPA: [ɪzˈba] ( listen)) is a traditional Russian countryside dwelling. Often a log house, it forms the living quarters of a conventional Russian farmstead. It is generally built close to the road and inside a yard, which also encloses a kitchen garden, hay shed, and barn within a simple woven stick fence. Traditional, old-style izba construction involved the use of simple tools, such as ropes, axes, knives, and spades. Nails were not generally used, as metal was relatively expensive, and neither were saws a common construction tool. Both interior and exterior are of split pine tree trunks, the gap between is traditionally filled with river clay, not unlike the North American log cabin. All of the building's components were simply cut and fitted together using a hand axe. Coins, wool, and frankincense were customarily placed beneath the corners of the house as an expression of the superstition that doing this would make the people living there healthy and wealthy. From the fifteenth century on, the central element of the interior of izba was the Russian oven, which could occupy up to one quarter of the floorspace in smaller dwellings. Often there were no beds (in the Western sense) for many members of the household, as people would sleep directly on the plaster top of the oven, or on shelves built directly above the stove. The outside of izbas were often embellished by various special architectural features, for example the rich wood carving decoration of windows. Such decorative elements and the use of the Russian oven are still commonly found in many modern Russian countryside houses, even though only the older wooden houses are called izbas today. 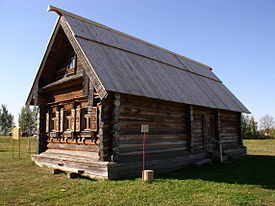 Wikimedia Commons has media related to Log houses in Russia.